Earlier this week, the National Association of Realtors sent a letter to FHA Commissioner Carol Galante urging her to rethink the agency’s new mortgage insurance structure. Since 2011, annual mortgage insurance premiums have risen from 90 basis points to 135 basis points in an effort to shore up reserves at the FHA. Additionally, many borrowers must now pay the annual MIP for the life of the loan, instead of having it fall off once the loan dips to an LTV of 78%. As a result, NAR believes hundreds of thousands of renters are being priced out of the real estate market. They estimate that anywhere between 125,000 and 375,000 potential home buyers now have nowhere to turn for financing, with conventional loans also too expensive thanks to PMI and higher interest rates relative to the FHA. 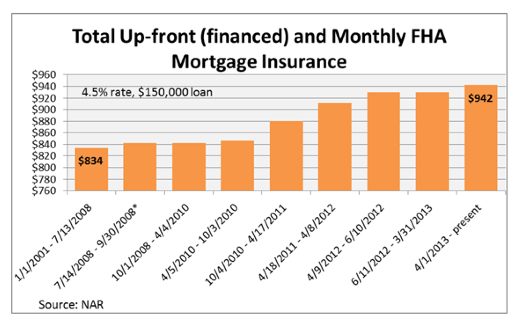 Even with a steady interest rate, FHA loan payments have risen markedly thanks to the new mortgage insurance structure. On a $150,000 loan set at 4.5%, the monthly payment has increased from $834 to $942 over the past five years. The fees alone on an FHA loan account for nearly 20% of the mortgage payment thanks to the rising annual MIP and an upfront premium that nearly doubled from 1% to 1.75%. Despite these increases, FHA loans tend to be cheaper than conventional loans at high LTVs. So these borrowers are effectively priced out if they have little to put down on a home. This is a problem because NAR notes that the FHA insured more than half of the purchase-money loans made to African Americans and Hispanics in 2012. Many of those affected are also the youngest homeowners, who have experienced the slowest income growth in recent years. To offset this potential roadblock, NAR has recommended that the FHA lower annual mortgage insurance premiums and no longer require that they be paid for the life of the loan. They believe this will slow prepayments of FHA loans, which has hurt the reserve fund of late. Per HUD data, FHA prepayments were at their highest level in fiscal year 2013 since the end of fiscal year 2004. And full payoffs with no subsequent refinance with the FHA accounted for 81% of the FHA’s prepayments. Making the desired changes could keep borrowers with the FHA for a longer period of time and boost revenue. Unfortunately, HUD made these very changes to their mortgage insurance structure to shore up reserves after capital levels fell below acceptable levels. The FHA also grew far too much in recent years, and the changes they made could help usher in private capital, which has been the goal of policymakers for a while now. Lastly, if FHA financing is still the cheapest game in town, it might be hard to convince them to change their ways. Hmph. It’s blocking people who have no business being in the mortgage market anyways. Never should have gotten away from 28/36 and 20%. A conundrum to be sure. Clearly the goal is to discourage FHA use while shoring up the fund. Short of abolishing it totally, that will not happen. All that has been accomplished is to discourage the stronger borrowers from using FHA, creating a pool that is even more slanted towards the low credit, low income, low reserves demographic, further increasing defaults. Only the government can find a way to create a lose-lose, making a tough situation worse. All the loans with equity are going somewhere else. Offer low MI to go with the low rates, and the loan pool will have fewer defaults going forward, and more income to boot. Oh, and do what it was supposed to – encourage homeownership – not break even. A strong housing market helps the overall economy, period. I know I am preaching to the choir, but still….